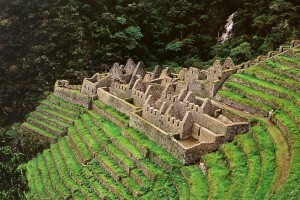 Wiñay Wayna's terraces may have been used to grow coca, which the Inca used in rituals. The Inca gathered at sites such as Sacsayhuaman to take part in festivals and religious rites. The Inca road has been explored and documented by researchers, including archaeologist John Hyslop who published an authoritative book on the qhapaqñan (royal highway) in 1984. Over the past few years, more than 300 participants from the Andean nations have surveyed some 9,000 miles of the road, documenting archival descriptions of routes from the early Colonial Period and carrying out more intensive research at sites found along or near it. While parts of the road are well preserved, others have been destroyed or replaced by modern routes. A goal of the project is to have the Qhapaq Ñan, the Main Andean Road, recognized on the UNESCO World Heritage List so it will be preserved for future generations. It is currently on the Tentative List. 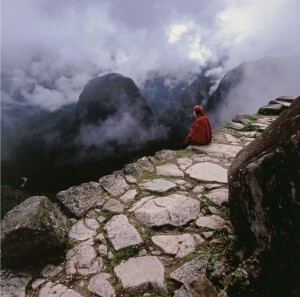 A traveler takes in the view from the Inca road near Machu Picchu. 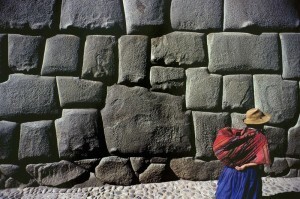 Inca craftsmen at Cuzco shaped massive blocks with hammers made of hard river stones. One standout shot shows a woman in a flowing blue skirt and straw hat balancing a red cloth bundle slung over her back. She follows her shadow toward a sundrenched wall of irregularly shaped gray stone blocks, and is no taller than three of them stacked up; the stones likely continue well beyond the reach of the shot, but how far? The photo is cropped tightly, making it impossible to see where the wall—an Inca ruler’s palace at Cuzco—begins or ends, both punctuating its monumentality and providing testament to the level of Inca stone craftsmanship also seen in the road system. 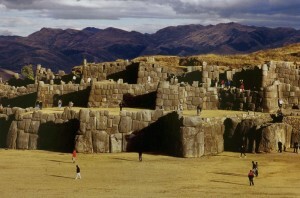 A shot of Sacsayhuaman (second image from the top of this page), a site used for festivals and religious rites, has a similar effect: tourists exploring the fortress-like structure look more like ants against the backdrop of imposing walls, mountains sprawling as far as the eye can see, and, possibly, an impending rainstorm. 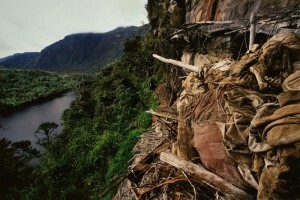 Mummy bundles of the Chachapoyas, who were conquered by the Incas, were found on a cliff near the road in 1996. “Highway of an Empire: The Great Inca Road” is on view at New York’s American Museum of Natural History through September 2011. This entry was posted in South America and tagged American Museum of Natural History, AMNH, archaeology, Inca, photography, R. Alan Covey. Bookmark the permalink.